When the Marc Jacobs Remarcable Foundation first came out last year, it was everywhere in the Blogosphere being both hyped up and criticised. 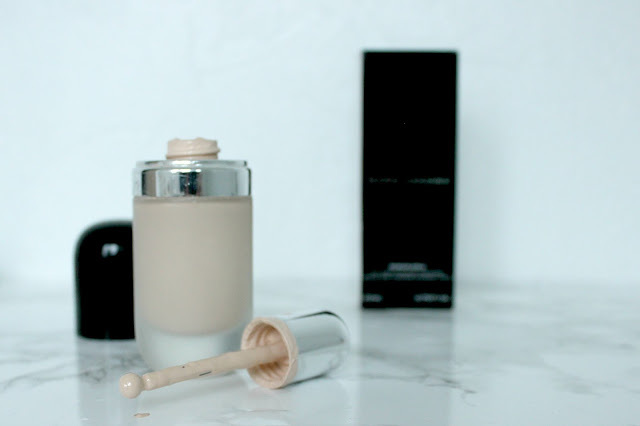 It was majorly praised for its high coverage whilst having a really light weight feel on the skin, however it was bashed for the poor shade range for deeper skin tones. Having had this foundation for a good 6 months now, I think it's time to give my verdict on this cult classic. "All day weightless finish. Beyond full coverage"
Retailing at £37 you would certainly expect this foundation to live up to this claim. In terms of coverage and texture I completely agree - it's such full coverage as it contains twice as much pigment as a regular foundation. It also has a surprisingly thin consistency considering the coverage it gives. It terms of a "weightless finish", I'm not sure I agree. Yes, it is very light on the skin, but does it look weightless? No, I don't think so. It certainly doesn't look overly heavy, but you can certainly tell you have got foundation on - which for me isn't a problem at all. In terms of "all day" I also disagree, it melts off my nose by the end of my day at uni which I do sort of expect. It also transfers onto clothes and other people, as well as masks (not ideal when you were a surgical mask for a good few hours a day). I also can find it to go a little cakey during the day - sorry Marc. I find this foundation a little difficult to apply on my nose, granted it is one of my problem areas. I suffer from large pores/blackheads and so it can often cake up in that area. I usually apply this with my RT Miracle Complexion Sponge but on my nose I find I have to use a little brush and really swirl it into my pores (yum). I also find it can cling to dry patches when using a brush. The shade range is great if you're from light to medium skin tone, if you're any darker then unfortunately you might struggle. I would consider myself very pale and ordered myself the lightest shade which is Ivory 10. To my surprise, this was actually far too light for me, but I rolled with it anyway, mixing in a little bit of a darker foundation to actually match me. For this reason, I would definitely try to get matched in a store if you're looking to buy this foundation as it can be very difficult to tell. The packaging. Oh, the packaging. It comes in a glass bottle with a little screw on lid and dropper. It looks gorgeous and so luxurious but it's actually very impractical. A lot of product gathers where the lid screws on so you actually waste a ton of foundation and it's a bugger to clean. Despite wearing this foundation everyday for the past 6 months, I doubt I will be repurchasing this foundation again. For just short of forty quid, I expected it to last a little longer and to not go cakey during the day. 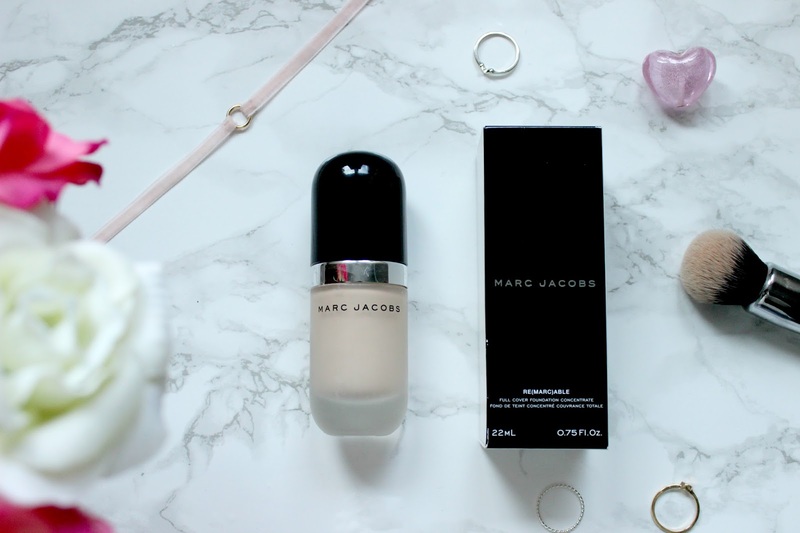 So, I'm still on my quest to find the perfect foundation, have you got any favourites? 10 comments on "MARC JACOBS REMARCABLE FOUNDATION"
I've heard so much about this and this is honestly what I expected. You can't have 'beyond full coverage' without a lil' bit of cake! So sad given its insane price though! yeah so many people love it!